Do you have questions about our Outback Power breakers, or questions about solar in general? Give us a call at 1-800-472-1142. FW-IOBD-120/240VAC The OutBack Power Systems FW-IOB-D-120/240VAC allows manual switching between the FX Series Inverter/Charger and a second AC source, facilitating maintenance and power continuity. The OutBack FW-IOB-D-120/240VAC is a field-installable kit for bypassing the AC input to the AC output for inverter maintainence or installation. This enclosure is intended for battery circuits configured for 12 to 48 volts nominal. Features Dual inverter Input-Output-Bypass for FW500-120/240VAC output @ 60 Amps 14.4 kW. Provides over-current protection. Includes Six 60A 120VAC single pole DIN mount breakers. Sliding bypass interlock plate, wire and hardware kit. 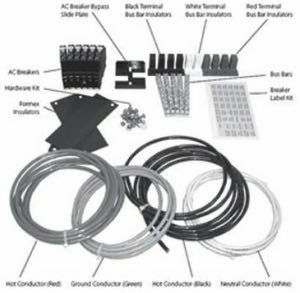 Field-installable kit for bypassing the AC input to the AC output for inverter maintenance or installation. Also provides over-current protection. 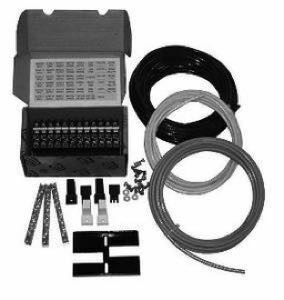 Includes Six 60A 120VAC single pole DIN mount breakers, sliding bypass interlock plate, wire and hardware kit. Specifications System Rating - Split Phase 120/240 VAC, 60 amps 14.4 kW Bypass Breaker- Two Poles @ 60 amps 14.4 kW Input Breaker - Two Poles @ 60 amps 14.4 kW Output Breaker - Two Poles @ 60 amps 14.4 kW The OutBack FLEXware FW-IOBD-120/240VAC is a cable assembly for bypassing the AC input on dual FX series inverter/chargers to allow loads to be powered from an external AC source without passing through the inverter. Designed for use with the FW500 dual-inverter systems that are connected to 120/240 split-phase systems. Includes six 60A 120Vac single-pole DIN mount breakers, sliding bypass interlock plate, wire and hardware kit.